© John Ford, Adamastor & Bacchus 2011. Cape Town’s favourite fish at the moment is definitely Tuna. Most people love it, it’s easy to cook without any fuss. Correctly filleted by your fishmonger, your Tuna should have no bones, skin or dark flesh. So no fishy waste at the end of your meal preparation. It hasn’t always been this way. When I was growing up my dad could only sell the Tuna he caught for R1.50/kg. This meant he’d often bring them home. We hadn’t heard of searing and sashimi in the early eighties and cooked the steaks until they were dry and tough. When we’d had one too many ‘dry tuna’ meals my Mom would boil the fish and make Tuna mayonnaise. Fresh Tuna mayonnaise tastes delicious! If you ever have an excess of fresh Tuna or offcuts you don’t know what to do with, I would recommend making home-made Tuna Mayonnaise. Poach the Tuna for about 4 minutes and allow to cool. My Mom added finely diced peppers, onions, seasoning and mayonnaise. This delicious mixture was spread onto thickly sliced fresh white bread. A real treat for school lunch! For now, I want to focus on the Longfin Tuna because I feel it’s seriously underrated by most people, in favour of Yellowfin Tuna and when looked after and cooked correctly is delicious. Good quality Longfin Tuna’s flesh is pink, firm to the touch and is translucent. 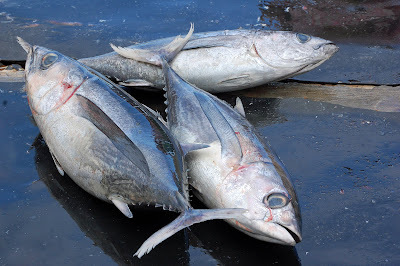 Longfin Tuna are caught by pole or longlines. They are found in clear blue water of about 17°C. They are often caught in an area called the Canyon which is 21 nautical miles from Cape Point, and it takes about one and a half hours to get there by boat. I recommend the pole caught Tuna above the longline caught Tuna as it’s more sustainable, on the SASSI green list and is better quality. The Longfin Tuna season lasts from about November until May, but the best fishing months are definitely February to May. At this time the Southeaster drops and the boats can get to the fishing grounds. Yellowfin Tuna is the Tuna we use for sushi; but good quality Longfin is also great for sushi and excellent to sear. Today’s recipe is for a Tuna pasta. For this Longfin Tuna is perfect, although Yellowfin will be just as delicious.